This week I am excited and honored to be taking part in the Yale Congregations Project in New Haven, Connecticut 21-26 June along with my colleague Melanie and my friend Brian. We comprise the team from St. Paul's Episcopal Church in Richmond, Virginia. I'm tweeting, too, using the hashtag #YaleCP. This morning was particularly intense, as I had previously agreed to play a very unfamiliar organ for our morning chapel service, and we were to give our plenary presentation immediately afterward. I gave myself a bit of a head start and figured out how to improvise my way through a prelude and lead "Praise, my soul, the God of heaven" and a canticle paraphrase from the organ. Ben Brody of Colbert Presbyterian Church was the other keyboard player for the service, and he had a wicked clever take on "O sing to the Lord" which also goes in my bag of tricks now. Immediately following this, we had our plenary session. The session was a lively, and thoughtful one: exactly the kind of thing we've come to expect here. Following our plenary was a very revealing role play that introduced the project from Holy Family Catholic Community. Suffice it to say that multi-cultural issues are not easy to navigate! In the afternoon I helped in the planning for tomorrow's Evening Prayer service and also snuck back into the setup for a contemplative space for tomorrow's Morning Prayer (labyrinth, cushions, candles, etc. ), and perused the Divinity School bookstore. Following this, I was fortunate to have a nice long time to work with John Ferguson on improvisation at the organ. 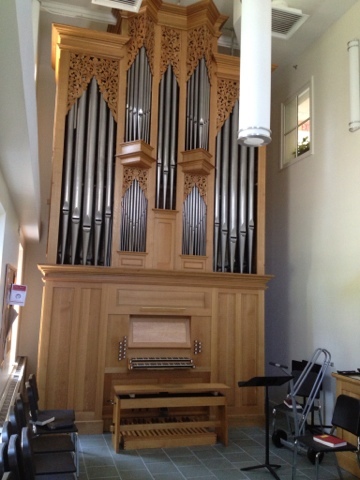 We worked on the Pasi organ (pictured). This was very enriching. I also got in a bit of time on the mean-tone Taylor & Boody before leaving the Institute of Sacred Music this afternoon. Our evening was spent at the very hospitable Dixwell Avenue Christian Church here in New Haven. The final plenary of the day was followed by a hymn festival featuring hymns and songs in the African-American tradition. I also want to point you to some other blogs that I've picked up along the way. "Telling the Story" at the official Congregations Project Blog.